Welcome to HP Lovecraft's Arkham, Massachusetts. You are an investigator working alongside Miskatonic University librarian, Professor Henry Armitage, tasked with unravelling bizarre mysteries inspired by the works of HP Lovecraft. You have at your disposal the Arkham Advertiser, a list of allies, a directory of businesses and residents, and a map of Arkham. You must follow the leads, consult with allies, and chase down suspects in order to solve each mystery. Twists and turns abound, and sometimes things may not be what they seem. Your sanity is at stake and your time is limited. Your friend and mentor, Professor Henry Armitage, will be conducting an independent investigation to which your skills will be compared. Each investigation presents a win/loss scoring system. There are no dice. Players work together, making decisions collectively to complete the most efficient investigation possible. 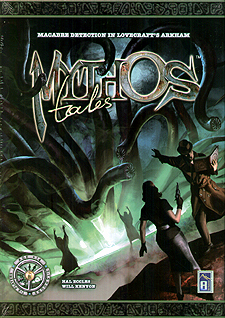 Mythos Tales uses an open-world system developed by experienced writers. Mythos Tales includes an Introduction by Richard Launius.